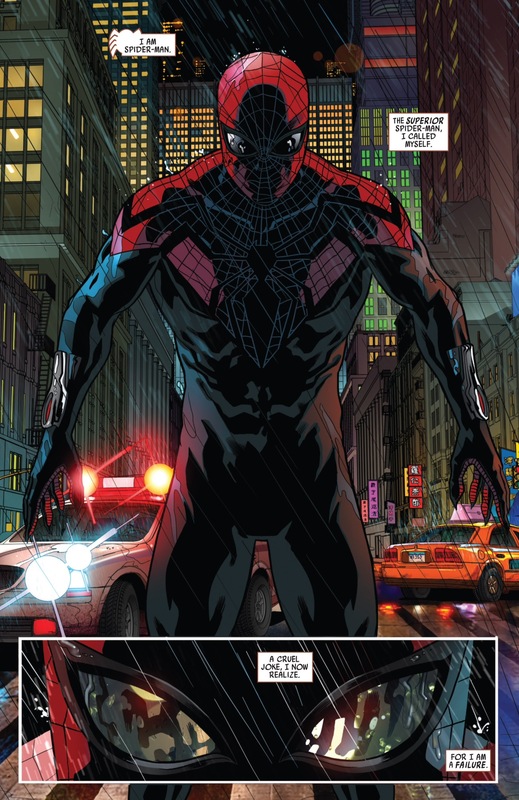 While it’s not being explicitly promoted as his last issue on the series, Superior Spider-Man Team-Up #8 certainly reads like an appropriate swan song for writer Chris Yost, one that also features some foreshadowing for what I expect to be the resolution of the larger “Superior” era and the return of Peter Parker in 2014. It’s really been a roller-coaster with Yost at the helm of Spidey’s “B” title over the past year, but Team-Up #8 is a perfect example of how whenever Yost has gone “smaller” in this series, and focused more on character and Doc Ock’s mental tug-of-war about what it means to be Spider-Man, the results have been mostly excellent. Considering the tone of how Team-Up’s last issue a few weeks ago, I was hopeful that we would continue to get similar character beats in Team-Up #8. While I appreciate the element of surprise, having a story go exactly as you had hoped/expected is not a bad thing, especially when it pays off all of the plot lines Yost planted earlier in this series. That’s just called good writing. 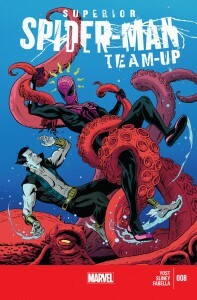 Team-Up #8 opens with Spider-Ock at his most dejected and despondent – his master plan of recruiting the Sinister Six and bringing them to the side of good was a colossal failure, and now he is faced with his own inferiority and inability to live up to the promise he made to Peter Parker’s dying body in Amazing Spider-Man #700 last year. 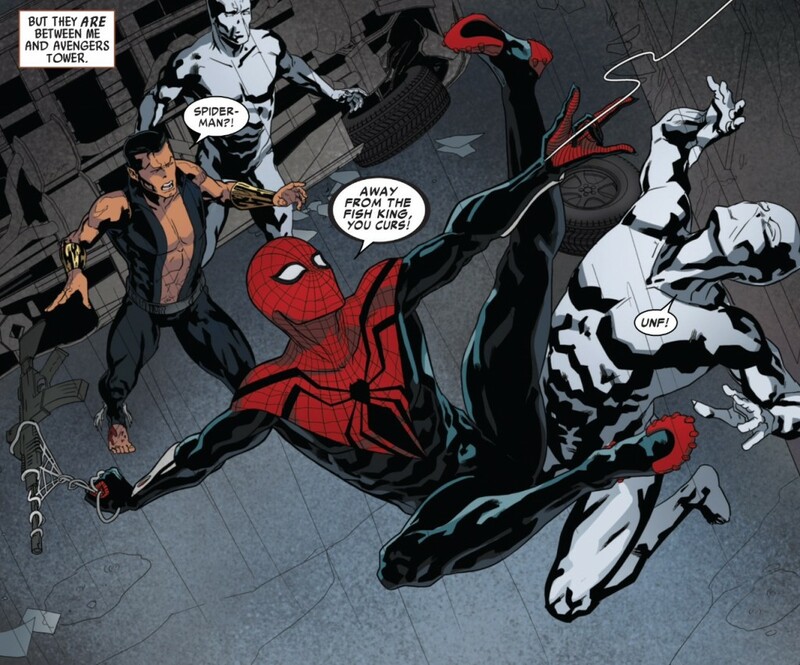 Before I go any further, let me just add that Yost has been the only Spider-verse writer to actually reference Doc Ock’s promise to Peter in ASM #700 in recent stories, and while I’ll readily admit I was a huge fan of the most recent issue of Superior Spider-Man, I sometimes wonder if Dan Slott is keeping any information that ties into Otto’s promise in his hip pocket to unveil closer to Superior’s supposed climax in a few months. For me, it’s a critical part of the “Superior” narrative that probably should have been serviced with far more frequency than it inevitably was. The overarching theme/focus of the “Superior” era has ping ponged between Doc Ock’s redemption and his own ego and hubris leading to his inevitable downfall, but a point that gets lost in the shuffle is how his promise to Peter in ASM #700 opens the door for both stories to be told. As the Superior Spider-Man, Doctor Octopus, a lifelong madman, has an opportunity to do good in this world and redeem himself. But because of his ego and his overall insecurity, he still needs to prove himself not only as Peter’s equal but as his superior. But beyond the references to Otto’s promise, Team-Up #8 also presents us with a potential end game scenario for Doc Ock’s time as Spider-Man. As he wallows in self-misery and doubt at the onset of this issue, he talks about turning himself in to the Avengers. He then starts to speculate that maybe Tony Stark or Hank Pym could do … and his thought trails off in time for him to encounter Namor, a meet-up that inevitably turns the tide for Otto and rescues him from whatever it is he was thinking of doing with the Avengers. So, of course the million dollar question is, what was Otto going to ask Tony or Hank about? 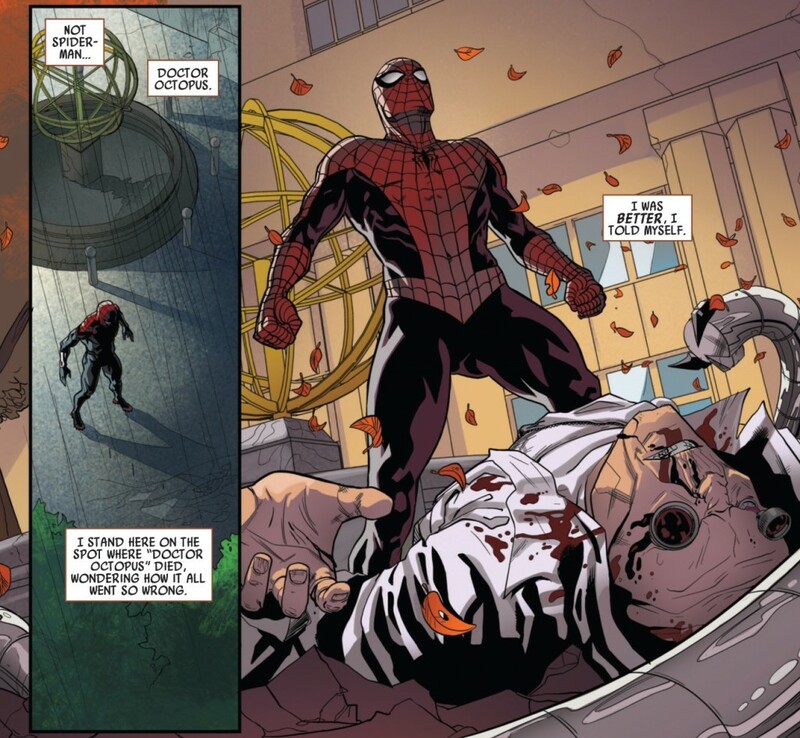 As the “Superior” story continues to accelerate and build towards a finale, I’ve developed a theory that the inevitable return of Peter Parker will be marked with Otto admitting his inferiority and ceding control of his body back to Peter’s mind and memories (which we witnessed in Superior #19 still exist within the Superior Spider-Man’s brain, despite the “Parker-ectomy” from Superior #9). As for what will transpire that will cause Otto to make such a drastic decision, that remains up for debate and speculation. But after running through a number of scenarios in my head, I’ve found that this theory is the most plausible, as well as the most appropriate (and I’d like to think it’s an idea that’s right in Slott’s wheelhouse as a storyteller). 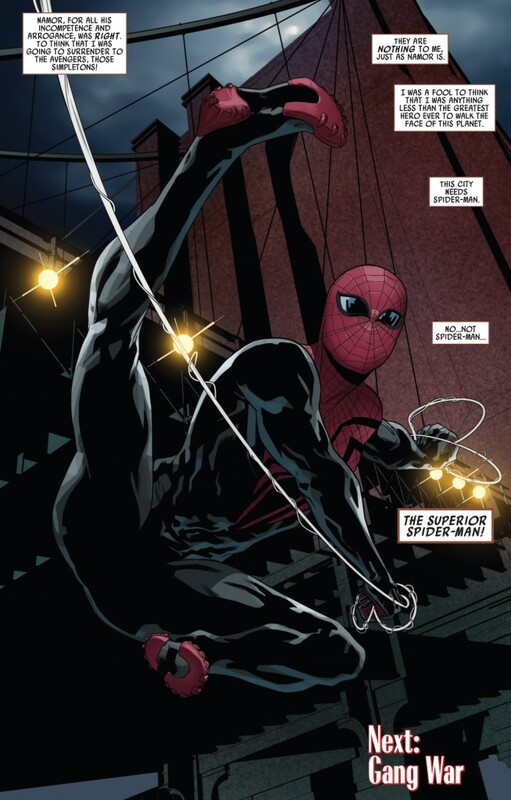 It marks a triumphant return from the dead for Peter, while letting Otto go out on one final moment of redemption –a moment that fully embodies the idea of “with great power must also come great responsibility.” It’s also a sacrifice so epic, it would truly make him the “superior” Spider-Man for admitting his flaws and relinquishing control to the one person who is best equipped to save the day. So that last paragraph was my long-winded way of saying, I’m fairly confident Otto was going to Stark or Pym about reversing the mind-switch and bringing back Peter. 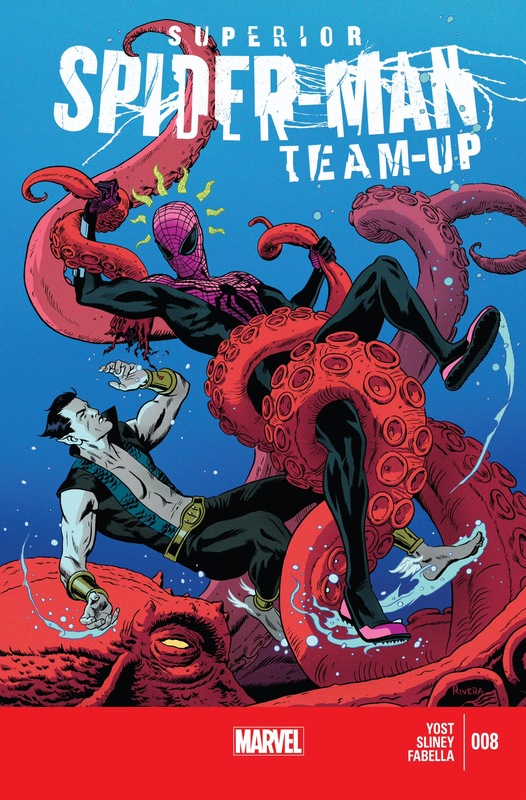 As for the actual “team-up” element of this story, I think Namor is an expert choice for Yost to rope into the story when Spider Ock is feeling so down on himself. What better way to give Doc Ock’s ego the kick in the pants he needs to get back on the horse than to bring in Marvel’s most notorious egomaniac in Namor? And Namor is at his very worst in this issue, constantly putting down Spider-Man’s attempts to assist and/or save him from what is believed to be Wakandan soldiers trying to take him down. The back and forth between the two characters is dripping with excellently written sarcasm and insults, bringing a dark humor to this story that’s honestly been lacking for a long while. 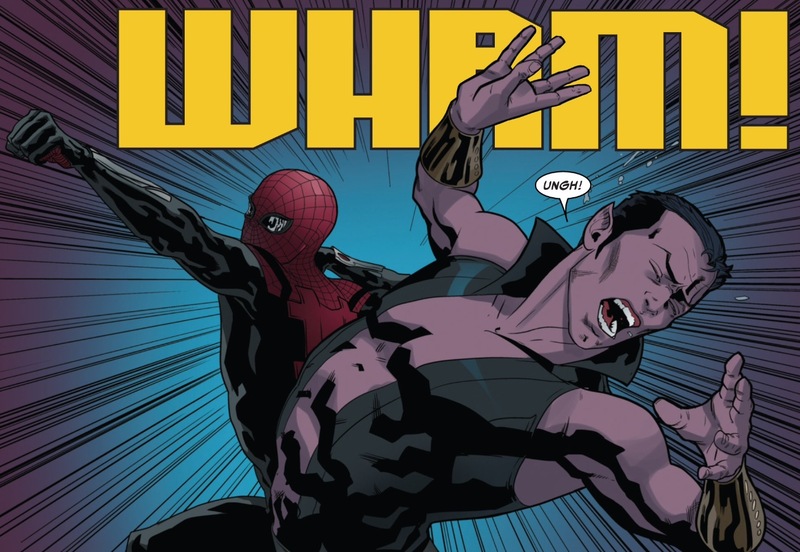 The resolution gives Spider Ock a chance to shine as a hero, and in turn provides him with the fuel to continue on as the Superior Spider-Man, but not before giving Namor a well-deserved punch in the jaw for bringing his war with Wakanda into Spidey’s city. 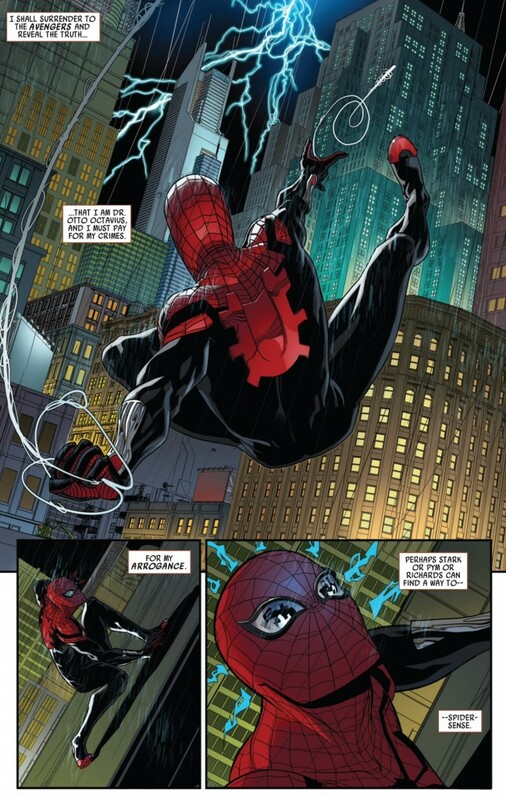 Otto’s triumphant turnaround captures everything I love to hate about Superior Spider-Man. Because at its core, the Superior Spider-Man is a story about an awful man, who’s vengeance and hatred put him in the unexpected position of being a hero. And while he will make good on this opportunity, he’s still going to maintain characteristics of the unlikeable jerk he was prior to his good fortune. In other words, I am most certainly rooting for Spider Ock, especially when he’s nose-to-nose with someone like Namor, but I kind of hate myself afterwards for doing, especially when he starts rambling on in that egomaniacal “Bond villain” way that he does. Yost’s run was inconsistent on Avenging Spider-Man and Team-Up, but he demonstrated more often than not that he understood this “love to hate” emotion the Superior Spider-Man elicits from the fanbase.